Jan 2017 - Licenced users have a new Parallel Build option. The option builds all files in each folder at the same time (as usual, only when they need to be built). Feb 2017 - All users now benefit from intelligent caching of the library discovery mechanisim described below. The 2nd time a project is compiled will be much faster and even faster the third time. Release compilation is always 1-1.5 seconds faster than debug. 15th January 2016 Visual Micro adopted (optional/default) the Arduino 1.6.6 + gcc based library discovery system. An example is the Microsoft AzureIoT Arduino Library that reference the SPI, RTCZero and WiFi libraries. This new automatic discovery of related libraries is a useful feature for new users but causes significant delay during compilation. Experienced users can switch off the "library in library" includes discovery by unchecking the "Visual Micro>Deep Library Search" menu item. The setting is per project. A global setting might be implement in future versions based on user feedback. The difference in compile time between an empty AzureIot library project 1) with the new Arduino 1.6.6+ system is 7 seconds and 2) without the new system using the older Arduino rexex system. 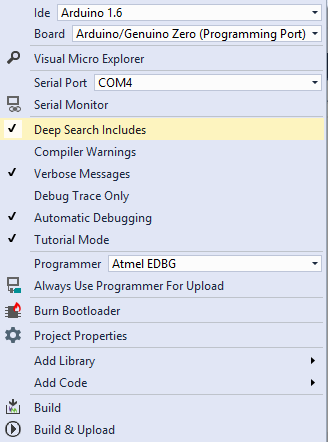 Using the older system by unticking the "Deep Library search" menu item and then adding #includes for the required libs (to the project_name.ino) will compile in less than 1 second. Viual Micro uses the older regex system to determine includes for intellisense purposes. This is because it can take many seconds to scan library sources which would disrupt the Ide during code writing. Hopefully as the next few months progress we manage to optimize and add intelligence to the "deep scan" enabling its use for intellisense.